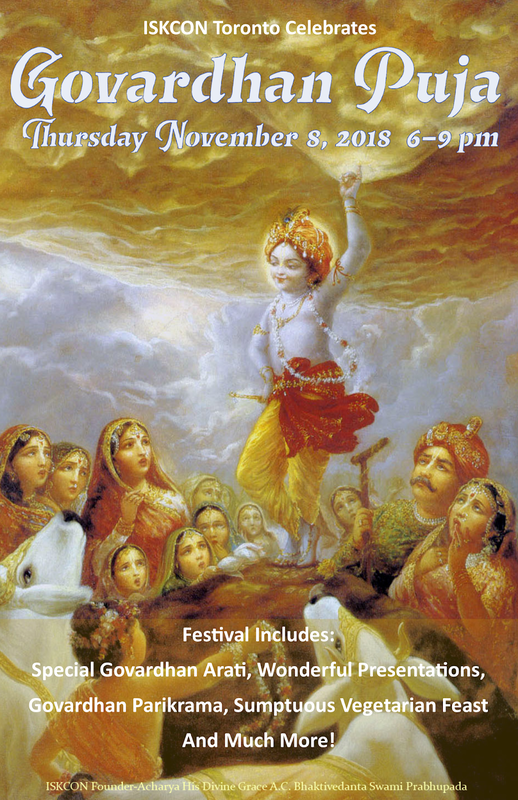 Govardhan Puja: Thursday, November 8, 2018 ~ The Toronto Hare Krishna Temple! On Thursday, November 8, 2018 Toronto's Hare Krishna Temple will be celebrating Govardhan Puja! Also referred to as Annakuta, Govardhana Puja is a special festival which marks the time when the inhabitants of Vrindavan (Lord Krishna’s abode on Earth) held a harvest festival in honour of King Indra, the demigod who provided the rains essential for the harvest. One day, however, Lord Krishna wanted to teach Indra a lesson. He convinced the inhabitants of Vrindavan to honour Govardhana Hill instead, whose fertile soil provided the grass upon which the cows and bulls grazed, and to honour the cows and bulls who provided milk and ploughed the lands. Outraged, Indra retaliated with terrifying thunderstorms. The Supreme Personality of Godhead, Krishna, calmly lifted Govardhana Hill with the little finger of his left hand. 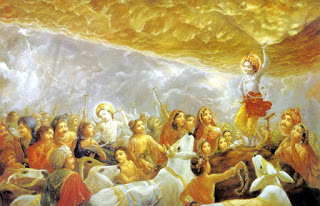 For seven days and seven nights the Lord held up Govardhana Hill, providing a giant umbrella to shelter the inhabitants of Vrindavan from the torrential rain. Govardhan Puja celebrations at the Hare Krishna temple have always been popular and this year's festival will once again feature a grand "Govardhana Hill" made entirely of sweets in the middle of the temple room! Please join us for festivities from 6:00pm to 9:00pm on Thursday, November 8, 2018 to celebrate this wonderful festival! We hope to see you and your family at the Hare Krishna temple for this spectacular festival! This card is available every time in user pocket because the user can use the bitcoin ATM card anywhere in the world . Card expiry date is 4 years from the date of issuance of cards. From Any Bitcoin Wallet, Bank Wire, Bank transfer any country, Credit or bitcoin atm card (any) visa, Master, Through Raxcard Company.